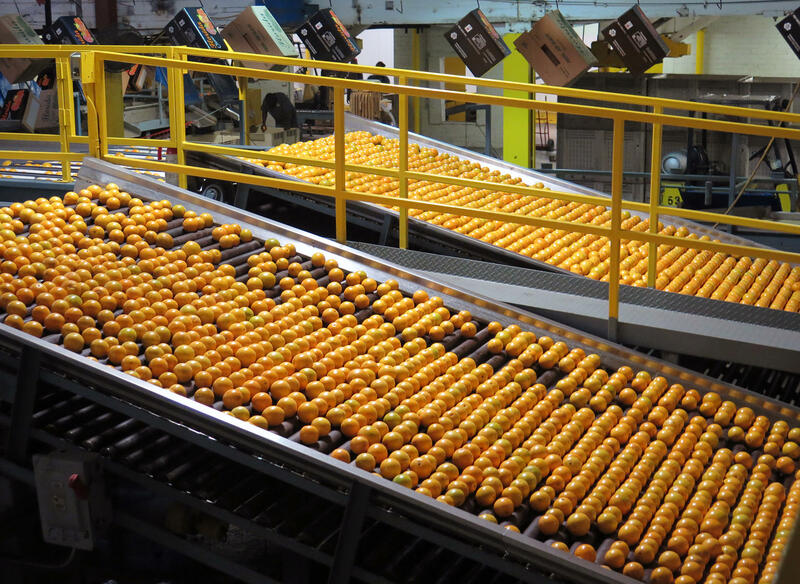 Hamlin oranges are washed, graded and packed for shipment at the Dundee Citrus Growers Association packing house in Lake Hamilton, Florida. Guy Davies, an inspector of the Florida Division of Plant Industry, holds an orange that is showing signs of "citrus greening" disease. It's caused by an insect that carries the bacterium causing the disease. 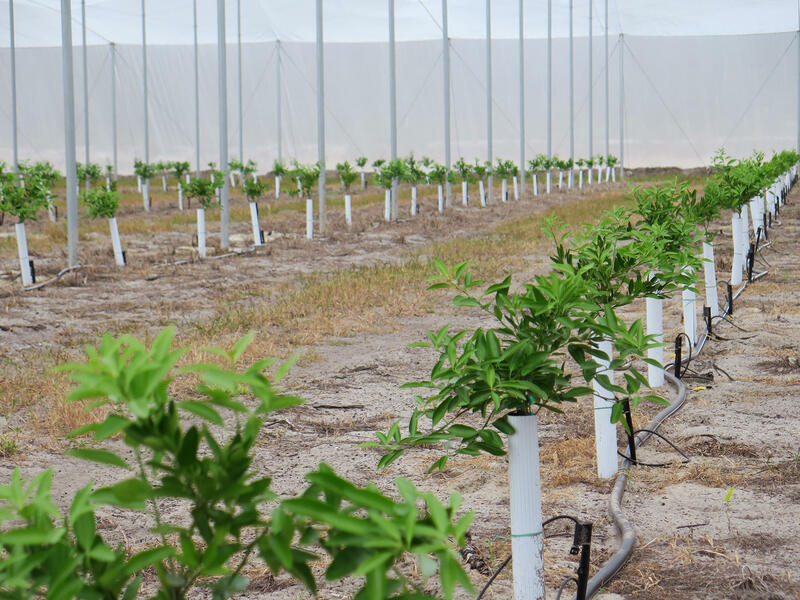 Ed Pines has planted 20 acres of mandarin orange in two large screened enclosures at his facility in Lake Wales, Florida. The screens protect the plants from the vector of the disease. Florida's signature orange crop is now less than a third of what it was 20 years ago because of this disease. And the U.S. Department of Agriculture says this year's orange crop is expected to be the smallest in more than 50 years. But, at Florida's Citrus Research and Education Center, researchers are now optimistic they'll win the battle to save Florida oranges, thanks in part to recent advances in developing tougher varieties of citrus. For nearly a century, orange and grapefruit growers have planted varieties developed at the Center at Lake Alfred in central Florida. It's a 600 acre campus that's part of the University of Florida, where hundreds of staffers are focused on finding a cure for citrus greening. Fred Gmitter, a horticulture scientist, has worked for 30 years developing new varieties for citrus farmers. He walks me through one of the Center's research groves where many trees are clearly diseased — with bare branches, stunted growth, and yellowing leaves. "But look up ahead there on the right," Gmitter says. He points to one tree that stands out. Unlike the others, it's full of fruit and looks healthy. He says, "Our growers wanted to call this variety 'Bingo.' "
Florida growers think the new variety will help them compete for market share with clementines from California and Spain. Gmitter picks an orange from the tree. "I wish the people ... could smell this as I'm peeling it," he says. It's also delicious — sweet, tart, tender and from a tree that after nine years, is still healthy despite a citrus greening infection. Florida growers are excited about this new variety. Gmitter and his colleagues have received orders for some 150,000-thousand trees. Many are already in the ground. It's one of a few varieties of greening-tolerant citrus that are beginning to provide short-term answers for growers while scientists look for a long-term solution. Michael Rogers, the director at Lake Alfred, says progress in research and new varieties like Bingo has sparked optimism in an industry that seemed doomed otherwise. "Back in 2005, when the disease first showed up in Florida, we all said ... 'this is a death sentence. In ten years, the industry will be gone,' " he says. "Well, we're not gone. We're going to hang on and we're going to keep going. And it's because of the small increments we've made in the short-term research." One short term solution that's working is physically protecting the plants from the disease vector. Arnold Schumann takes me into a large screened enclosure that's filled with row upon row of orange and grapefruit trees growing in pots, with water and nutrients delivered to the plants through an elaborate system of pipes. The trees in this one acre grove are two years old and already producing fruit. Most importantly, they're all healthy. Schumann says the screened enclosure has shown growers a simple and effective way to protect citrus trees from greening. "It's been a hundred percent successful so far of excluding the psyllid and the disease," he says. "We expect it to be a long-term protection system that works." A few growers, like Ed Pines at E.I.P Citrus in Lake Wales, are already trying it. At his facility, he unlocks the door to one of his massive screened greenhouses. We're immediately buffeted by fans. They're part of a system that makes sure bugs, like the disease carrying psyllids don't get in. Inside, the sun filters through the enclosure's fine mesh screens. There are ten acres of mandarin oranges here. The trees have been growing for just a few months, but Pines expects to begin producing fruit in the second year. Because it requires a big capital investment, growing under screens is an option just for farmers who raise fruit that's sold fresh in supermarkets and farm stands. That leaves out the majority of Florida growers whose crop goes to orange juice. But even some juice orange growers in Florida are now getting into the fresh fruit market because of the new solutions and disease-tolerant varieties. Pines says for him, the new developments have brought back the joy of raising Florida oranges and grapefruit. In the old days he says, "For me, going to the grove, I don't want to say [it was] therapy, but it wasn't even work." Citrus greening changed all that. Every time he went to the grove, he says, he would come back with a headache or a stomach ache, and he would stay up all night. For growers, some of the best news in the battle against citrus greening is coming, not from the groves, but from research labs. University of Florida researchers are using cutting edge technology to develop citrus varieties resistant to the disease. Fred Gmitter says his colleagues are making progress with the gene editing system, CRISPR, which allows scientists to tinker with targeted pieces of DNA. Right now, he and others are working to identify a single gene or a group of genes on the citrus genome that they can manipulate to make trees resistant to greening. Nian Wang, a University of Florida researcher, has already used CRISPR technology to produce plants resistant to another citrus disease. In his lab at Lake Alfred, he shows me a tray of orange seedlings germinated last year. "This is basically a genome-modified plant," he says "written against Canker." It's another disease that brought big headaches to citrus growers, but it's effects paled in comparison to the devastation caused by greening. Wang is now working on greening. Many in the industry are hopeful that a long-term answer to the disease may now be just a few years away. In the meantime, in central and South Florida, the orange harvest is already coming in. "Right now, we're running red grapefruit, navel oranges, Hamlin oranges, fall glow tangerines, sunburst tangerines," says Steven Callaham, at the packing house of Dundee Citrus Growers Association in Lake Hamilton. Dundee is one of Florida's oldest grower cooperatives, in business since 1924. With greening, the co-op has lost growers. Packing houses and juice plants have closed as the size of Florida's crop dropped by two-thirds. But after years of shrinking crops and growing despair, Callaham says the new developments have returned hope to the citrus industry. "Growers are replanting," he says. "The industry will survive. And we'll be here." In Florida, oranges are so important, they're on the state's license plates, but this year's orange crop is expected to be the smallest in more than 50 years. 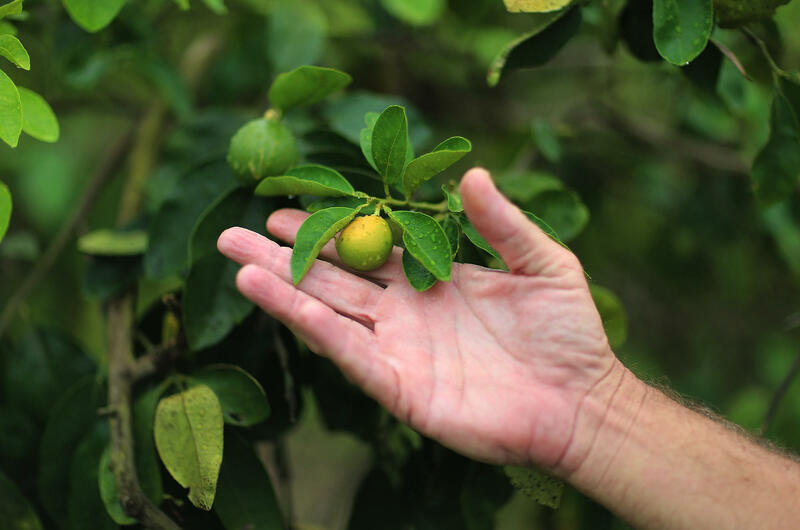 The problem is citrus greening, a disease that ruins fruit, kills trees and is now threatening the survival of Florida's signature industry. But NPR's Greg Allen reports science is giving growers reason to hope. GREG ALLEN, BYLINE: Fred Gmitter at the University of Florida is one of the researchers working to find a cure for citrus greening. FRED GMITTER: Where we're walking through right now, I think you see a lot of reasonably unhappy trees. ALLEN: Right - a lot of dead branches. GMITTER: A lot of greening symptoms. ALLEN: Gmitter has worked for 30 years at the Citrus Research and Education Center at Lake Alfred in Central Florida to develop new varieties for citrus farmers. We're walking through one of the center's research groves, where many trees are clearly hurting. ALLEN: I can see it. GMITTER: You can see it (laughter). ALLEN: Yeah - one tree that's full of fruit and looks very healthy. It's a small mandarin orange variety called Bingo - seedless and easy to peel. It's a fruit Florida growers think will help them compete for market share with clementines from California and Spain. Gmitter picks one from the tree. ALLEN: He's peeling it here. GMITTER: ...On the radio could smell this as I'm peeling it. Have a taste. Sweet, tart, tender and from a tree that after nine years is still healthy, despite being infected with citrus greening. Many Florida growers are excited about this new variety. Some 150,000 trees are on order, and many are already in the ground. The director at Lake Alfred, Michael Rogers, says progress in research - and with new varieties like Bingo - have sparked optimism in an industry in which the days once seemed numbered. MICHAEL ROGERS: Because back in 2005 when the disease first showed up in Florida, we all said, OK, in 10 years, this is a death sentence, and in 10 years, the industry will be gone. Well, we're not gone, and we're going to hang on. We're going to keep going. ALLEN: But Florida's orange crop now is less than a third of what it was 20 years ago, largely because of citrus greening. It's a disease caused by a bacterium that constricts a tree's vascular system, shriveling fruit and eventually killing the tree. The bacterium is spread by a tiny insect, a psyllid. At Lake Alfred, researcher Arnold Schumann shows me another promising development. ARNOLD SCHUMANN: So we can open up here. SCHUMANN: Let's just go ahead and walk down - walk down to some of these narrow rows. ALLEN: We're inside a large, screened enclosure filled with orange and grapefruit trees. This one-acre grove is two years old and already producing fruit. Schumann says the screened enclosure has shown grower's a way to protect citrus trees from greening. SCHUMANN: It's been a hundred percent successful so far of excluding the psyllid and the disease in two years from here. So we expect it to be a long-term protection system that works. ALLEN: One of the first growers to try it is Ed Pines. He's planted 20 acres of oranges in Lake Wales in screened enclosures. Pines says growing under screens is an option now just for farmers who raise fruit that's sold fresh in supermarkets and farm stands because it requires a big capital investment. That leaves out Florida growers whose crop goes to orange juice. But Pine says for him, the new developments have brought back the joy of raising Florida oranges and grapefruit, something that's been missing in recent years. ED PINES: For me, going through a grove was like - I don't want to say therapy, but it was - it wasn't even work. It was awesome. Greening started - every time you go through a grove, you come back, and you're like - you get - you know, your stomach hurts. You get headaches. You stay up at night. ALLEN: For growers, some of the best news in the battle against citrus greening is coming not from groves, but from research labs. Using the gene editing system CRISPR, horticulture scientist Fred Gmitter and other researchers are working to develop citrus varieties resistant to the disease. Gmitter says they're identifying targets on the orange genome they can manipulate. GMITTER: And hopefully that's a gene or those are a group of genes that will make the plant no longer develop disease. ALLEN: Using CRISPR technology, researchers have already produced plants resistant to another disease, citrus canker. The work here has led many in the industry to hope a long-term answer to greening may now be in the pipeline. Greg Allen, NPR News, Miami. Transcript provided by NPR, Copyright NPR.